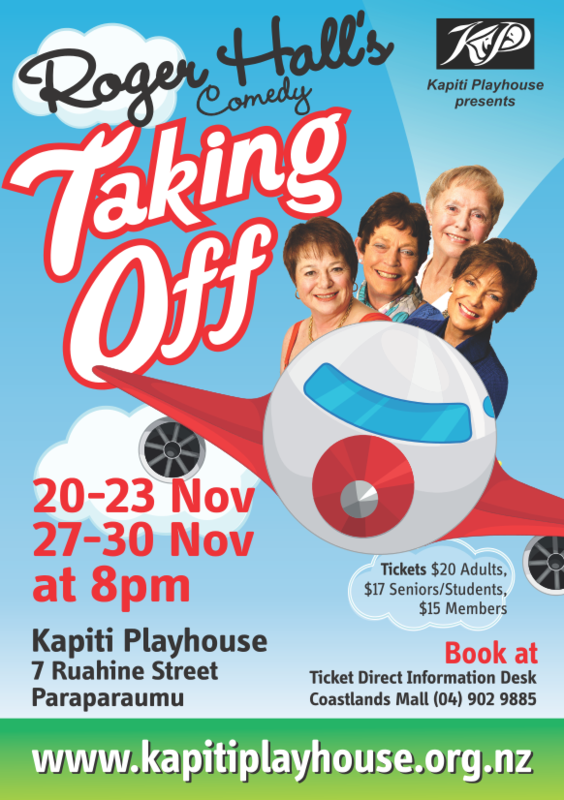 Roger Hall's Taking Off - Kapiti Playhouse Inc.
Rehearsals have started for Kapiti Playhouse’s final production of 2013 – Roger Hall’s Taking Off. The play, directed by Tony Tait, flies onto the stage in November. Keep an eye out on this website and also our Facebook page for more information as it comes to hand including when you can get hold of your tickets! 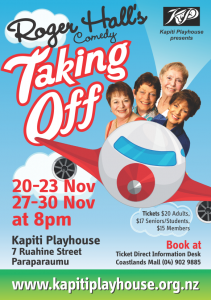 Taking Off sees four women in their 50-60s taking off on their first overseas experience and is poignant, funny and sensitive as these people take on a new lease of life heading for the UK. You’ll see credible characters, familiar and, as usual from Roger Hall, quintessentially us. It also captures our quirks, our nature and our special relationship with the UK. Roger Hall has, of course, written many plays and this continues with his humorous depiction of New Zealanders with this play being based on material obtained from many women throughout the country. Roger Hall is one of the most successful playwrights of his generation. Possibly best known in this country for his “Gliding” series, he has consistently written for the stage as well as radio and television scripts. His writing is known for its comedy, political, social and underlying pathos and his plays have toured widely and been performed at international venues. His play “Middle Age Spread” ran for 18 months in London’s West End and was awarded Comedy of the Year.